In the previous few posts, we've seen a lot of detail about the so-called damascus barrels. We've also seen a genuine damascus barrel is very beautiful and requires a lot of labor to produce and is therefore expensive. In our last post, we also saw how fake damascus barrels were produced. The number of cheap fakes that were produced served to lower the public's perception of damascus barrels in general, because the fake barrels burst a lot easier and wore out quickly. Meanwhile, various steel-making processes were improving and some of the prominent steels in the late 1800s were the Whitworth Fluid Compressed Steel, the Siemens-Martin process steel and Krupp Steel. Whitworth fluid compressed steel was invented by Mr. Joseph Whitworth, who we already talked about when discussing polygonal bore rifling and the Whitworth rifle. Mr. Whitworth was the eminent mechanical engineer of his day and came up with a way of producing a stronger cast steel. His process consists of melting a steel ingot into a mold and applying pressure of up to 6 tons/sq. inch to the mold while the steel is in a liquid state. The pressure drives out all the gases and eliminates blowholes in the cast steel. It also increases the density and strength of the steel. 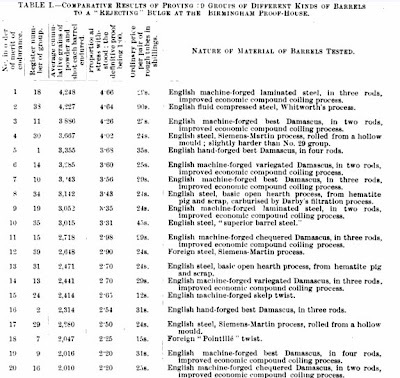 According to W.W. Greener's book, The Gun and its Development, with the introduction of choke boring in shotgun barrels, whitworth steel was found very suitable for this process and started replacing damascus barrels, and he mentions in 1875, "Whitworth steel was giving great satisfaction for rifle barrels, a leading London gun-maker adopted it for shotgun barrels." The leading London gun-maker was Purdey & Sons, who used Whitworth steel exclusively for years after that. Use of Whitworth steel for gun-making spread to America as well and well known makers such as Parker, L.C. Smith and Lefevre were making guns using this steel, way into the 1930s. In the Siemens Martin process, pig iron is melted in a reverberatory furnace and wrought iron or iron ores are added until a desired degree of carbonization is reached. Oxides are removed and manganese and carbon are added by using a small quantity of ferromanganese. The amount of carbon left is ascertained by dipping a small ladle into the melted metal and cooling it and then breaking it apart and analyzing it. If found to be the right amount, the rest of the metal is poured into ingots and allowed to cool. Then the ingots are passed between rollers to reduce the thickness to the desired size. This process is slower than the Bessemer process, but it allows the manufacturer to more precisely produce the desired grade of steel of a uniform quality. Another big manufacturer of barrels using the fluid-steel process was Krupp of Essen, Germany. Krupp's process used a slightly different composition of steel and was also used by several gun makers. In all, thirty nine specimens of barrels were tested, with a total of 117 different barrels used for testing. The barrels were initially loaded with a standard Proof House test amount of gunpowder and shot, using the same machinery to load, to ensure that the amount of tamping down of gunpowder and shot was uniform. Then all barrels were fired and then checked for signs of bulging and those with bulges were rejected. The next test used a heavier gunpowder charge and heavier shot and the remaining barrels were fired again and tested for bulges and the tests were repeated using more and more gunpowder and shot. We have already discussed damascus barrel grades such as the "laminated steel" and "best damascus steel" in this post previously. The best barrel was a laminated steel (a type of damascus steel) barrel, followed by a Whitworth fluid steel barrel, followed by another damascus steel ("Best damascus" grade) and a Siemens-Martin steel barrel. 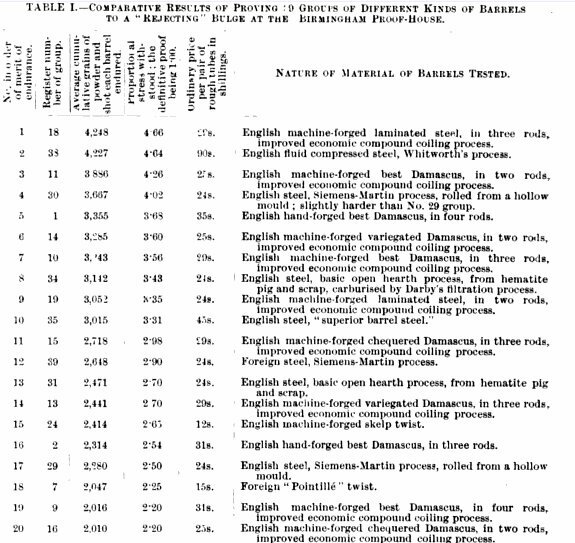 Note how English barrels dominate the test because some of the foreign types (especially Belgian barrels) used weaker iron in their manufacture. While Whitworth steel finished second in this test, they were just getting started in perfecting the technology and it soon became a lot cheaper and faster to manufacture as well. By 1895, when they held another test, Whitworth steel came first in this test. The rise of smokeless powders also had a lot to do with the decline of damascus barrels. Smokeless powders generate a lot more force than black powders. Smokeless powders also burn along the length of the barrel since they're slower burning than black powders, which mainly burn at the breech end and blow out an unburnt quantity out of the muzzle. Many damascus barrels couldn't withstand such pressures and those that could needed a lot more time and effort to manufacture. Hence steel barrels became more and more popular as smokeless powder became prevalent. The next post will deal with manufacturing of modern steel barrels.